Danger meets sophistication in the soulful music of The Lucky Losers, San Francisco’s premiere male/female duet fronted band. Accompanied by a dynamic four piece ensemble, veteran Bay Area artists, Cathy Lemons and Phil Berkowitz deliver a truly signature sound, layering elements of Stax/Volt styled R&B, electric Americana, and psychedelic rock atop a Chicago and Texas blues foundation. The Lucky Losers perform powerful original music about transcending the dark side of the American dream, the beauty and pain of being alive, and devotion in all it’s complexities. Described as “the finest light-skinned female blues vocalist in the U.S.” (Real Blues/2010), fiery Dallas born entertainer, Cathy Lemons has a velvet voice with a gritty edge and the rebel conviction of a woman risen from the ashes. New Jersey native, Phil Berkowitz, "has earned renown as one of the West Coast’s most distinctive harp players, as well as for his sharp, resonant tenor" (Living Blues/ 2018). Phil is The Lucky Losers’ mysterious leading man. Phil possesses a polished tenor that recalls legends of the past and his expert musicianship fuels the passionate dialogue with Cathy. The stark contrast between incandescent Cathy Lemons and elegant Phil Berkowitz makes for a captivating musical union, breathing new life into American songwriting tradition and the vanishing art of duet singing. In July of 2014, The Lucky Losers emerged onto the scene and have been entertaining audiences across America ever since. Cathy Lemons and Phil Berkowitz delivered an outstanding debut album, “A Winning Hand", which marked the beginning of their fruitful collaboration with Kid Andersen at his famous Greaseland in San Jose, California. The Lucky Losers recruited top West Coast players, such as Grammy award winning guitarist, Steve Freund (Sunnyland Slim), Andersen himself, and Ben Rice, who won the 2014 International Blues Challenge for “Guitar” in the Solo/Duo category, to make their dreams come alive. "A Winning Hand" went on to peak at #5 on The Roots Music Report’s “Top 50 Blues Albums” and reach #1 on Blues 411's "A Baker's Dozen of Blues", garnering a nomination for a Jimi Award in the "Best Traditional Album" category. The album was listed as one of the "Top Blues Albums of 2015" by The Roots Music Report. Dan Akroyd (Elwood Blues) chose their original song, "Change in the Weather" as "Bluesbreaker of the Week" for his internationally syndicated "Bluesmobile/Everything Blues" radio show. The Lucky Losers landed the cover of the November 2015 issue of French magazine "Blues and Co." Living Blues, Elmore, Classicalite, Blues Matters, Blues Blast, Blues Bytes, and additional influencers in the blues community concluded that The Lucky Losers had dealt a winning hand. 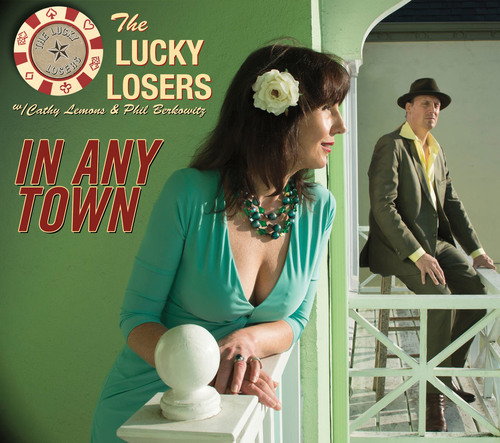 In the summer of 2016, The Lucky Losers released "In Any Town", their sophomore album on Dirty Cat Records featuring stellar musical contributions from Kid Andersen, Paris Slim, Terry Hanck, and Jeff Jensen. Inspired by music of the 60's and true events from their beautiful, twisted lives, Cathy Lemons and Phil Berkowitz served up medicine for wayward souls, offering glimpses of paradise through a veil of tears. Within two weeks of its release, "In Any Town" which peaked at #10 on The Roots Music Report's "Top Albums/Blues, #2 on The Roots Music Report's "Top Albums/All Genres/ California" and #3 for "Top Blues Rock Albums." A month later, Living Blues Radio Charts placed it at #6. Eight songs from the album charted into the top 20 on The Roots Music Report's "Top Singles". The album was also nominated by Blues 411 for a Jimi Award for “Best Harmonica Player” and “Best Contemporary Blues Album”. "In Any Town" was featured in several notable end of year lists such as Richard Ludmerer’s "Top 50 Independent Blues Albums of 2016" (of Making a Scene). Critics from all around the world gave the album rave reviews. In 2017, The Lucky Losers toured extensively nationwide in support of "In Any Town" accompanied by incendiary guitarist, Laura Chavez, who was listed by Guitar Player Magazine as one of the world's "Top 50 Sensational Female Guitarists". “In Any Town” was nominated for total of seven awards, five Independent Blues Awards and two Blues 411 Jimi awards. In 2018, The Lucky Losers continued their winning streak upon the release of their third record, "Blind Spot", produced and engineered by long-time collaborator, Kid Andersen. “Blind Spot” is a road warrior’s tale, solely comprised of original material created by Cathy and Phil alongside their multi-talented songwriting partner, Danny Caron (Charles Brown). Traveling through a winding soundscape of modern blues, vintage R&B, and Americana, “Blind Spot” presents unvarnished testimony to the fragile and fleeting state of our world. The album features contributions from Blues Music Award winner/ guitarist, Kid Andersen, IBMA Momentum Award winning violinist, Annie Staninec (Rod Stewart), 2019 BMA nominated saxophonist, Nancy Wright, and 2019 BMA nominated guitarist, Laura Chavez. The Lucky Losers concluded a 26-venue/ 15 state tour of North America in honor of the album’s release in the Spring of 2018, and a second tour to the Eastern seaboard in the Fall of 2018. The album made the Roots Music Report’s “Top 50 Blues Album Chart” for 26 weeks/ with 4 weeks in the Top 10, peaking at #9; and also for 32 weeks on the RMR “Contemporary Blues Album Chart, peaking at #5.” The album peaked at #10 on the Living Blues Radio Chart. “Blind Spot” has also been on “Top 50 California Chart” for a total of 32 weeks/18 weeks Top 10. Nine original songs from the album made The Roots Music Report's "Top 50 Singles” in Blues & Contemporary Blues". In 2018, The Lucky Losers were nominated for three Independent Blues Awards from Making a Scene: Best Independent Blues R&B/Soul Artist, Best Independent Blues R&B/Soul CD/ "In Any Town", and Best Independent Blues R&B/Soul Song/ "It Ain't Enough"! Looking ahead to 2019, The Lucky Losers are about to embark on their “Route 66” Spring Tour 2019, travelling to Arizona, New Mexico, Texas, Alabama, Florida, Georgia, North Carolina, South Carolina, Tennessee, Mississippi, Missouri, Oklahoma, and Kansas — a total of 13 states! The Lucky Losers were born in the summer of 2013 on a deserted road in Sedona, Arizona. With a Willie Dixon song on the stereo, Cathy Lemons and Phil Berkowitz spontaneously began to sing together and felt a spark of magic. So it was, that two seasoned blues musicians came together to begin a new adventure, inspired by the vanishing art of duet singing. Roughly a year earlier on a dark night in San Francisco, soulful vocalist/harmonica ace, Phil Berkowitz dropped by The Saloon and was instantly captivated by the siren song of blues singing legend, Cathy Lemons. Phil sought to make her acquaintance, inviting her to perform with him at Club Fox in Redwood City. While rehearsing for the show, Cathy Lemons marveled at Phil’s encyclopedic knowledge of American music and his unique sound, a hybrid of country, soul, and R&B. A tall, blonde, good looking man, decked out in tailored suits, fine hats, and strange checkered shoes — Cathy felt an immediate attraction. When Phil would bend down on one knee and sing a Charlie Rich song, she felt goosebumps. Then she noted the shiny ring on his hand... Phil was a married man. A year later, Phil went through a divorce and Cathy separated from her long-time beau, Johnny Ace. They fell in love and took off on a road trip to Sedona, Arizona. The rest is history. Upon their return to the Bay Area, Cathy and Phil continued to sing together, fashioning the beginnings of what would become their distinctive signature sound. An inventive, hypnotic spin on blues, classic R&B, and Americana. The Lucky Losers tested the waters by competing in a regional International Blues Challenge (IBC), sponsored by The Golden Gate Blues Society. They fittingly won “The Wild Card” round, which allowed them to compete in the finals. Although they were a brand new band and did not take the crown for a chance to compete nationally, it was clear as day that they were stronger together than apart.